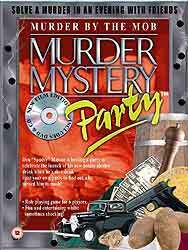 Murder by the Mob Murder Mystery Party game includes an optional DVD and CD. Watch the short pieces of film to reveal clues about the murder...play the CD of themed background music to create just the right ambience for your investigation! Chicago in the late 1920’s is overrun by the mob, most of whom have been invited to 'Spudsy' Malone’s party. However, when the Don welcomed everyone to celebrate the invention of his new potato alcohol drink, he wasn’t expecting any of them to ‘do him a favour’ and shoot him in the chest. Host your own party to find out who whacked the big potato! An excellent way to spend a role-playing evening with friends. Each party takes 2-3 hours to play. They are filled with intrigue, suspense, humour and the fun of playing both detective and suspect. This game is designed to be played by 3 male and 3 female players. Invitations to be sent to your guests. Complete instructions on how to host the party. Character playbooks for all six suspects. Costume suggestions. Menu suggestions. Clues. Solution to the murder. Note that the optional DVD and CD content is not included in the download but they are not required to play the game.